The most popular pressure washer by Annovi Reverberi which is a very well respected company in the high pressure pump business and as such have carried over their 50 plus years of experience in to AR Blue Clean ,a branch of their company to serve the pressure washer market. AR Blue Clean AR383 packs with a tough of 1,900 pounds per square inch of grime removing power.This is the upper scale for PSI on an electric pressure washer.This directly translates to efficient stain removal for you the owner and not wasted time spent trying to clean your drive way. 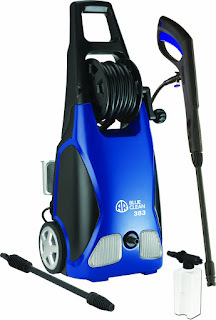 With a two-wheel trolley mounted unit with handle and hose reel. Automatic safety valve with pressure shut-off at pump head.Total Stop System (TSS) for automatic start/stop. Attachable foamer/soap bottle. Equipped with a 3 axial-piston wobble plate pump, long-lasting induction motor, gun-wand. Gun wand assembly with a fully adjustable spray head, detergent tank, water filter, detergent injector kit and high pressure hose.Rotary nozzle and TSS standard.GFCI and automatic safety valve with low pressure by-pass is standard on all blue clean models. This is one of if not the best machine for around the home.With a top quality pump and high amount of cleaning units for a machine in this price range there’s not much jobs in the home that this machine cant tackle.